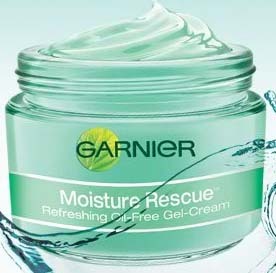 Garnier Moisture Rescue Refreshing Gel Cream locks-in moisture and blocks-out dryness using a formula with a unique combination of pure antioxidant fruit water extracts and skin conditioning Vitamin E.
Locks-in moisture for 24 hours. Can also be used with Moisture Rescue Lightweight UV-Lotion SPF 15 to help protect skin against UV damage. 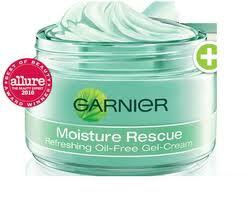 It helps replenish skin's moisture reserves and fights off dryness. It's ultra lightweight, oil free, refreshing gel-cream formula instantly penetrates for long-lasting moisture and boosts skin's natural defenses so that it can hold moisture for 24 hours.